When it comes to our anti-ageing products, which ingredients should we really be looking for? The best sunscreen ingredient for providing protection against the long wavelength UVA rays that are ravaging our collagen and contributing to hyperpigmentation; and now that it’s available in a micronized format, it doesn’t have to cause a grey-ish finish on the skin! A lightweight and fast-absorbing broad-spectrum sunscreen that makes for the most wearable of high factor protectants. A brilliant all-rounder, it’s well-tolerated (and can even increase tolerability of more irritating ingredients like retinoids), plus it helps reduce hyperpigmentation and ageing-associated inflammation. The most substantiated of all the anti-ageing ingredients, unless you’re pregnant or suffer from rosacea you should probably be using a retinoid! It improves fine lines, improves texture and tone, and helps improve pore quality, so they’re less prominent and unclogged. 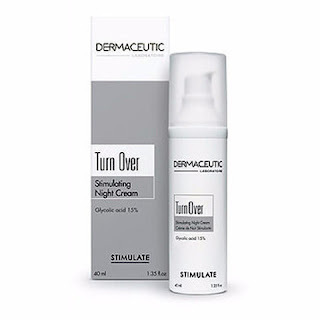 If you have never used retinol products before, begin by limiting use to twice a week, then gradually increase frequency to every other night, and finally once an evening as tolerated. Consult your skincare professional for a dosage schedule appropriate for your skin. Apply a pea-sized amount of Retinol 0.5 to thoroughly cleansed skin in the evening. Carefully avoid the eyes and the corner of the eyes. To ensure optimal results, wait at least 30 minutes before applying any corrective or moisturising products the same evening as applying Skinceuticals retinol. Do not use retinol products if you are pregnant or lactating. Do not use if taking prescription acne medication, or if undergoing a skin peeling regime. Chemical exfoliation delivers more precise and controlled improvements in skin texture and tone. It also improves penetration of other skincare ‘actives’ such as vitamin C .
Dermaceutic Foamer 15 - Removes impurities and dead cells, and purifies the skin. Dermaceutic Turnover cream - The formula of concentrated glycolic acid removes dead cells that build up on the skin’s surface and stimulates cellular renewal. A great choice of chemical exfoliant for those with oily/combination skin. It has anti-inflammatory properties, exfoliates and therefore increases cell turnover and also gets into pores to keep them clear and unclogged, reducing visibility. Skinceuticals Blemish Age Cleansing Gel Designed for ageing skin prone to breakouts, it combines potent cleansing agents with salicylic acid to decongest pores, smooth irregularities and brighten skin. Vitamin C is vital for healthy functioning collagen, so correctly formulated and appropriately packaged vitamin C in its L-ascorbic acid is a worthwhile investment. A daytime vitamin C serum that delivers advanced environmental protection and improves the appearance of lines and wrinkles, loss of firmness, and brightens skin's complexion. A dark spot diminisher that helps to rectify the effects of sun damage.